Canadian-bred French bulldog Bru is truly "on fire" as she became the first of her kind to win the nonsporting group at the Westminster Kennel Club Dog Show in Madison Square Garden. I’m On Fire, almost two and one-half years old, on Monday endured an 8:00 AM appointment to commence proceedings at the first day of the 2009 Westminster Kennel Club Dog Show, out-strutted and out-showed 35 other French Bulldogs to win Best In Breed, and then returned to the Madison Square Garden dog ring Monday evening to defeat 17 other Best In Breed winners in the Group and secure a spot in Tuesday night’s Best In Show competition. So maybe he sleeps in Tuesday morning? No way. I’m On Fire will be out of his dog nest and out the door while most pooches are dreaming of milkbones to appear on Martha Stewart’s television program. When he returns to the Garden tonight he will be joined for the Best In Show contest by a Whippet named Starline’s Chanel (winner of the Hound Group), the very impressive Puli named Conrad (winner of the Herding Group for the second year in a row) and a toy poodle called Moon Walk (winner of the Toy Group). 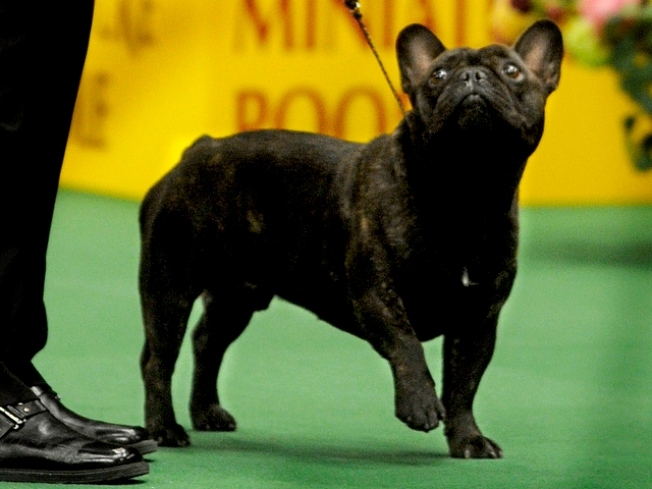 I’m On Fire is the first French Bulldog to win the Non-Sporting Group at Westminster. He defeated the top-winning Non-Sporting dog of 2009, the bulldog Razzle Dazzle, as well as big winning poodles from the Standard and Miniature varieties. Breeds in the Sporting, Working and Terrier Groups will be judged Tuesday from 8:00 AM to 4 PM, and best in group awards for those three groups will be made Tuesday evening to complete the field of seven contestants for Westminster’s Best In Show competition to immediately follow.